If you are an Iron Man fan, today rocks. With Tony Stark's critically acclaimed comic selling gangbusters, Marvel has stated a second 'early years' series; Iron Man Legacy will debut in April, coincidentally just before Iron Man 2 hits cinemas. Me - having collected Iron Man since before there was a 'War Machine' - my first reaction to the new series was 'Dam I wish that could've been Force Works'. Written by Dan Abnett and Andy Lanning before they used Nova to save Marvel from Annihilation, the Works was more than just a clone of the Image comics at the time, it featured the former West Coast Avengers proactively protecting the world, through the ability to predict the probability of chaos events erupting. 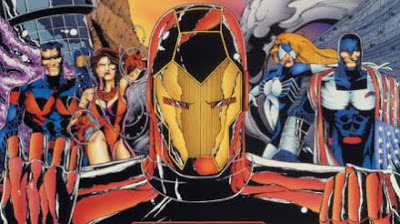 IRON MAN: A pro at keeping secrets from his Avengers team-mates, Stark would clandestinely fund, found, and tip off Force Works, in order to ensure he would never again be forced to 'download' his mind in order to protect it's knowledge. SCARLET WITCH: Presumed dead or leading the life of a nomad, Wanda is easily located by Tony Stark and offered the chance to rebuild her status, as the hero she's always been, surrounded by friends. US AGENT: A true 'Worker' at heart, Jack jumps back into the fold - encouraging Julia Carpenter to live at the works HQ, until she sorts out her identity in the wake of the original Spider-Woman's return. CENTURY: Having almost written earth off as a lost cause, the axe-wielding alien Century sees hope in the reformation of the team he first called home. WAR MACHINE: Rhodey and Tony's friendship has had it's ups and downs, but with Iron Man not physically part of the team, Tony turns to War Machine's military might and tactical knowledge to lead and bring power to the Force. I'm glad I wasn't the only one who remembers Force Works fondly. While I'm not sure how it holds up, I really enjoyed it at the time. Thanks for that Shag! Glad I'm not the last fan standing! FW may need a few tweaks to run with the modern crowd again but I'm sure Marvel could get it back in perfect working order.